On 18 November Univ women’s rugby team faced off against Worcester in Oxford University’s first full-contact intercollegiate match independent of Cuppers. After our run to the Cuppers semi-final last year, we were looking forward to developing our skills further in a much longer, full pitch game as we grow as a team. A successful recruitment at Freshers’ Fair has bolstered our numbers, whilst every member of last year’s team still at Univ has continued to play, using their experience to support all of our new players, none of which had played full contact rugby before. With William Heard and Ruairi Clayton once again coaching us in weekly sessions, we have progressed quickly, motivated by the prospect of the upcoming match. The commitment and enthusiasm shown by every member of the team paid off, as over the course of the 45 minute game, we scored 4 tries on our way to beating Worcester 20-0. Panthers player Meryem Arik crossed the line twice, whilst a try apiece from second year Marjolaine Briscoe (playing at scrum half despite no previous experience of the position) and first year Clodagh Holmes testify to the depth within this year’s growing squad. Strong defensive efforts from the entire team, meanwhile, made it very difficult for Worcester to make any ground at all, as Univ dominated in rucks and made several key turnovers. 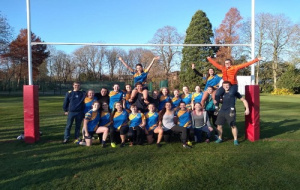 We still have another term’s worth of training before our Cuppers campaign, so we have high hopes for the women’s rugby team this year, as well as in the future.